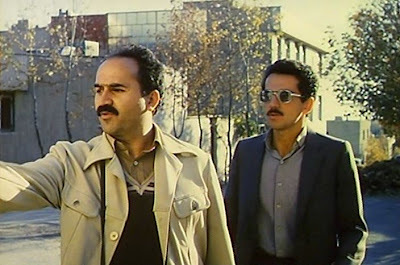 Close-Up (Nema-ye Nazdik, 1990) was perhaps Abbas Kiarostami’s most critically-acclaimed film, and yet it was apparently something of an opportunistic spur-of-the-moment production that was made without much prior planning. Kiarostami, who was born in 1940, had been directing mostly documentaries, along with a couple of neo-realist-styled fiction films, since the 1970s, but he only first came to the attention of European and American audiences with his innocent and unassuming Where is the Friend’s Home (Khane-ye Doust Kodjast?, 1987) about an eight-year-old boy in the northern Iranian town of Koker. He was making plans for his next feature, Life and Nothing More (Zendegi va Digar Hich), also to be shot in Koker, when he heard about a news item in Tehran that interrupted his plans and led him to make Close-Up based around that event first. The story concerns an out-of-work printer’s assistant and film buff, Hossain Sabzian, whom a certain Mrs. Ahankhah, who is sharing a bus seat with him, observes reading a screenplay by Iranian filmmaker Mohsen Makhmalbaf. When she asks him about the book, Sabzian impulsively tells her that he, himself, is director Makhmalbaf. The woman is highly impressed and invites him to her house to visit her sons, who are film enthusiasts. Over the following week Sabzian maintains the charade, visiting the Ahankhah house many times and generally sponging off their hospitality. To pique their interest, he tells the family that he is interested in making his next film at their home and starring the family. Eventually the family becomes suspicious that the man is only a fraud, and they have him arrested. 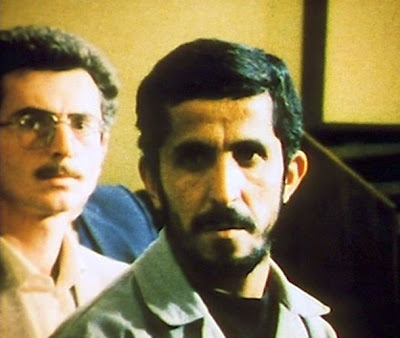 When Kiarostami read an article about the case, he went to the authorities and obtained permission to film the trial of Sabzian, and much of the resulting film covers Sabzian’s testimony during this trial. The film closes with Sabzian being released from jail and having an emotional meeting with his hero, the real Mohsen Makhmalbaf. To a degree, Close-Up is a defining film for Kiarostami. 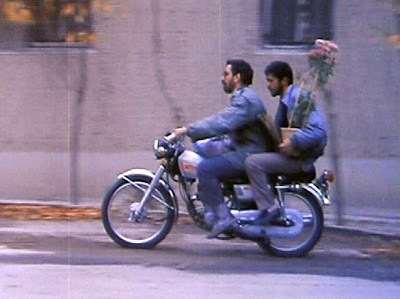 It attracted serous critical attention from film scholars (especially the French) when it was released, and examining the film today still offers an occasion for looking into the nature of Kiarostami’s style and his unique popularity in film scholarship circles. There are indeed some unusual aspects to the film. First of all, the film does not easily fall into a simple classification, because although it could be considered a documentary film, many of the scenes are dramatized reenactments of real events, and yet these dramatic reenactments are performed not by hired actors but by the very same people that were involved in the original events. Secondly, Kiarostami reflexively calls attention to the filmmaking process in Close-Up, a breaking of the “fourth wall” that would become almost a Kiarostami trademark. For me there were three general aspects of the film that I found particularly interesting: (1) the multiple narrative structures, (2) Iranian cultural background issues, and (3) the aesthetic issue of realism in Kiarostami’s films. 1. The Multiple Narrative Structures of Close-Up. The syuzhet as it appears in the sequence of images presented to the viewer. The fabula that we, the viewers, construct concerning the original events of Sabzian impersonating Makhmalbaf. The fabula that we also construct concerning Kiarostami’s cinematic reconstruction of what happened. This is significant, because Kiarostami, who is both the author and a viewer, turns out to be one of the principal characters in this multi-layered story. The structure of fabulas #2 and #3 make things more complicated, because we may have difficulty drawing the line between artifice and our presumptions of reality. The film opens with a 15-minute sequence covering Sorush magazine journalist Hossain Farazmand’s taxi trip with two soldier-policemen to the Ahankhah’s house to make the arrest on Sabzian. Because of the camera shot setups, the film editing, and the fact that Farazmand’s chatter to the two soldiers provides the necessary background concerning the reasons for the arrest, it is clear that this opening segment is a fiction-film beginning, not a documentary. 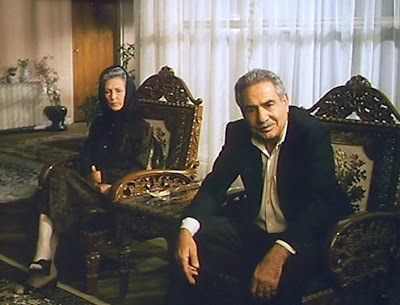 But at the end of that opening fiction-film segment, the film titles finally roll across the screen, after which we switch over to documentary-film mode, as Kiarostami begins interviewing the police and the Ahankhah family in order to get his own background information on the story. 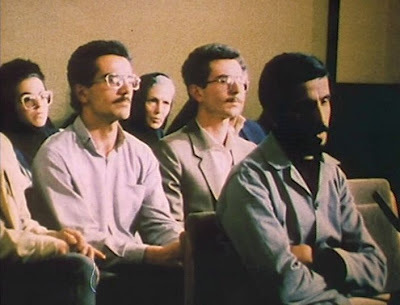 We will later switch back and forth between documentary-filmed testimony in the trial and reenactment scenes dramatically recreated later by Kiarostami which visualize and flesh out some of Sabzian’s testimony. Although Kiarostami blends these two narrative streams together relatively seamlessly, the viewer is still likely to be aware of the shifts and mentally occupied with the context switches between the two narratives (the two fabulas under construction) as he watches it play out. In fact the viewer is never absolutely sure if even the supposedly documentary-style segments are truly authentic or are themselves artfully staged (I will assume that they are authentic). So this is one aspect of the film that has fascinated the more intellectually-minded cineastes: the reflective game-playing with film narrative. The degree to which Kiarostami had self-consciously mapped out the nature of this reflexive narrative is unclear, however. 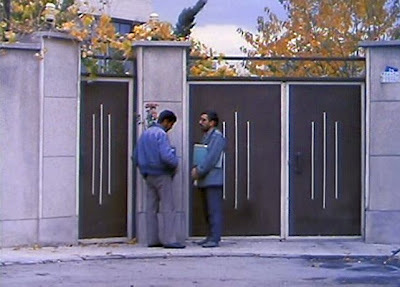 When Kiarostami first interviews the accused, 22 minutes into the film, Sabzian plaintively asks him, “can you make a film about my suffering?” Later in his court testimony, Sabzian says that he admired Makhmalbaf, because of that filmmaker’s depiction of the sufferings of the underprivileged. “That film is a part of me,” Sabzian asserts. His entire defence, in fact, is to claim that the reason for his crossing the line of lawful behaviour was because he had so thoroughly identified with his idol, Makhmalbaf, that he wanted to emulate him. Though about ten years younger, Makhmalbaf was an apt role model for Sabzian, because his filmmaker hero had also been an uneducated youth from an impoverished background, and, like Sabzian, was a hardline religious conservative. His most recent film, which had so thoroughly captivated Sabzian, had been The Cyclist (Bicycleran, 1987), which depicted the sufferings of an impoverished Afghan refugee. Because of Sabzian’s obsession with the sufferings of his condition and his readiness to quote classical poetry in the courtroom, many Western critics have championed Close-Up as a film that recognizes the redeeming and ennobling powers of art and the soulful potential of the common man (and thereby the commonality of all men). However, before one’s emotive feeling run to far in that direction, one should reflect somewhat on Iranian popular culture. Compared to most Americans and Europeans, Iranians, and this cuts across a wide spectrum of popular culture, are more given to philosophical speculation. They are also much given to meditating on the presumptively tragic and fatalistic circumstances of life. In addition, poetry has a much greater presence in everyday interactions in Iranian culture than in the West, so Sabzian’s poetic sensitivities were not so unusual in the Iranian context – in fact Kiarostami, himself, is a published poet. But Sabzian does seem to be somewhat unusual in other respects. Although uneducated, he seems unusually articulate and highly reflective. Moreover, his behaviour and statements suggest that he is not so much a man of the people, but more the opposite – something of a narcissist. In Chokrollahi and Mansouri’s 1996 documentary, Close-Up Long Shot, which interviews Sabzian several years later, these aspects to his character are apparently more clearly revealed. What Kiarostami had under his microscope in Close-Up, then, was not the noble, common man of the working class, who was speaking for all his “brothers”, but instead appears to have been more of a loner obsessed with his own victimhood. In fact Sabzian strikes me as a poseur who habitually plays a role in order to fool others and perhaps himself, too. Such a person, who is always “on stage”, tends to make a better actor than do most people, and this is undoubtedly why Sabzian’s performance is so seamlessly effective across the interleaved documentary and reenacted segments of the film. Kiarostami implicitly acknowledged this when he asked him during his court testimony whether he (Sabzian) wasn’t an imposter and still acting even at that very moment, while talking to the judge. Thus the bottom line is that we cannot say Close-Up is an authentic paean to the sufferings of the common man; it is actually an examination of a single, self-pitying individual. Another interesting cultural element on display in Close-Up, though admittedly it is only tangentially significant to the subject of Kiarostami’s style, is the presentation of the court trial. (I assume that this part of the film was an authentic documentary-style r ecording of a real event and not artificially staged.) What interests me is the contrast between the Iranian Islamic court procedures on display in these sequences and the legal systems common to English-speaking countries. In the film we see an evidently learned Islamic magistrate taking the lead in the court proceedings and cross-examining all the parties to the dispute. The court procedures seem to be largely informal and are not driven by references to legal precedents and narrow legal protocols. The goal is for the magistrate simply to arrive at the truth, and also to see if he can work out some sort of accommodation on the part of the parties that is mutually agreeable. It is almost like a schoolmaster resolving a dispute between two of his pupils. In the West, by contrast, we might have expected Sabzian’s type of offence to be addressed in a civil, not a criminal, lawsuit. In fact in a Western context, we might expect the aggrieved party to be Makhmalbaf, since Sabzian has falsely assumed the film director’s identity and threatened his public reputation. In the Close-Up case, though, Sabzian is not being sued for damages, but instead for having committed the crime of fraud and for presumably “casing” the Ahankhah house for the location of valuables in connection with a planned future robbery. 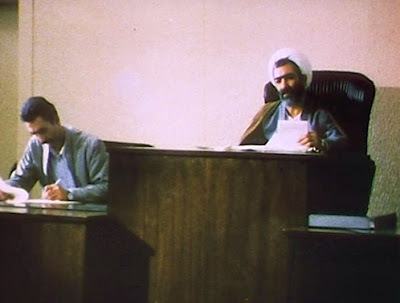 In the event the Iranian magistrate (a) listens to Sabzian’s testimony, (b) becomes convinced of his sincerity and relative innocence, and (c) ultimately persuades the Ahankhahs to drop the court case. In this kind of situation shown in the film, everything works out pretty satisfactorily, (after all, the Ahankhahs did get to be in a film), but the process strikes me as heavily dependent on the wisdom and wise judgment of the presiding magistrate. He has a considerable degree of latitude to invoke his own prejudices. The notions of cinema vérité, which actually go back to the work of Dziga Vertov and his Russian colleagues in the 1920s, became popular in France during the 1960s. The goal was to capture objective reality, “the truth”, with the camera. When the popularity of cinema vérité spread to the US, it became known as “direct cinema”, but there was an often-overlooked difference. The American filmmakers adopted a “fly-on-the-wall” approach: they wanted to make the camera so inconspicuous, so “invisible”, that the subjects being filmed were not consciously aware of its presence. The camera was to be an objective record of reality. But of course this is a fiction: the camera always has its presence and its point of view in any filmmaking activity. The French cinema vérité documentarians tended to acknowledge explicitly this presence of the observer, and they incorporated their own observations into their recordings. Kiarostami’s work definitely follows along the lines of the French tradition, but he sometimes crosses the lines, and there are sequences of seemingly direct cinema or even fictionalized accounts mixed into his films. This, of course, raises questions concerning what is truly real in his films. the initial interview of Sabzian in jail. the interview with the Ahankhah family at their home. the court case featuring the testimony of Sabzian and the Ahankhah family. the final meeting between Sabzian and Makhmalbaf. the associated scene of the arrest shown later from inside the Ahankhah home. a second camera with a telephoto lens always maintaining Sabzian in close-up during his testimony. This is the critical dialectic of the film and underlies the significance of the film’s title. The first camera is showing the court case in documentary “objective reality” fashion. But the second camera has a different aesthetic. With Sabzian in close-up and “playing” to the camera, there is a different, more personal and self-conscious level of reality on display. Whether the second camera is more “real” or not is open to question, but at least the two cameras evoke contrasting emotional effects on the viewer. Altogether it is the provocative use of mise-en-scène to provide alternate forms of reality that has attracted attention to Kiarostami. In particular in Close-Up, the blending of documentary “reality” and dramatic reenactments is what attracts the attention of cinema academics. Of course we know (and Kiarostami seems to be suggesting this) that the camera in the documentary film sequences will invariably have some behavour-altering impact on the subjects filmed, and therefore these sequences will not come out to be absolutely true representations of objective reality. So that means that neither the dramatic reconstructions nor the documentary sections are representations of objective reality. In fact, one might speculate that the dramatic reconstructions could have the edge over the documentary-style sections, because they have a certain heightened sense of reality (compared to the documentary sequences) due to the fact that the original participants can more effectively highlight and project their original intentional states (as they remember them) when they re-perform those roles in the staged events. Could Kiarostami’s hybrid form of documentation, then, somehow get at the truth more effectively than conventional approaches? Upon reflection, I don’t think so. I am inclined to think that true “objective reality” is never a realistic option for film, which inevitably must present the world from a contextual perspective of the storyteller. Nevertheless, the metaphorical ill usion of objective reality by means of the “silent witness” of the camera is indeed commonly assumed by filmmakers and filmgoers alike, and Kiarostami is, consciously or not, exploring the boundaries of this illusion. On the whole Close-Up is not a cohesive and aesthetically pleasing narrative experience. I don’t believe that a deep social message is present in the film or that the “truth” of Sabzian has been revealed therein. But the film is interesting, nonetheless. Whatever pleasures it does offer are not aesthetic, but lie primarily on the intellectual plane in connection with our speculations concerning how we construct visual narratives in our imaginations.